I really wanted to find a compact riding mower that was under $1000 and had good user reviews. This was not easy, but I was able to find the Ariens 42-inch riding mower that fit most of my criteria. It has really good reviews and it is priced under $1000, it is just not as small as the Weed Eater One. I still consider it compact, but at 45-inches wide it can't fit into the same small area as the Weed Eater. The Ariens 42-in Model # 960160027 features a 17.5 HP Briggs and Stratton motor with a 6-speed transmission that can handle hilly terrains. The Ariens 42-inch looks like a nice step up from the Weed Eater One, but as always, read the online reviews for yourself to see if it matches what you need. 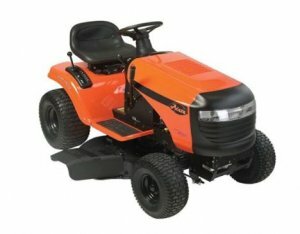 You can find the Ariens 42-inch Riding Mower at HomeDepot or other Ariens dealers.